Are you ready for Halloween?! To be honest, I’m not! This month has flown by and I’m in scramble mode to get some things done! You may remember, our neighborhood has a block party of sorts for Halloween. I have tons of ideas of what to take for the potluck – but I haven’t quite nailed it down yet. 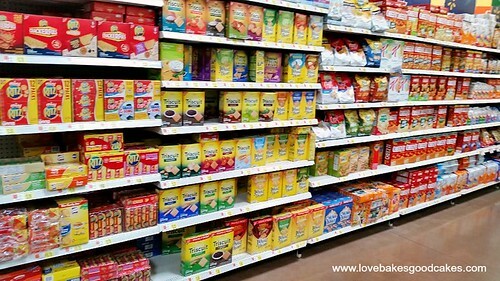 While shopping at my local Walmart this past weekend, I saw the Oreo, Fanta and Wheat Thins In-Store Demo at the end of the cookie and cracker aisle. If you follow me on social media, you probably saw this picture of the demo that I share on Instagram. I usually skip the food carts at the store but since I was looking for some Halloween inspiration, I stopped by! With Halloween only days away, it seems everyone is making plans for trick-or-treating and fun parties. I saw people buying last minutes bags of candy and people scouring the costume aisle for the perfect costume! 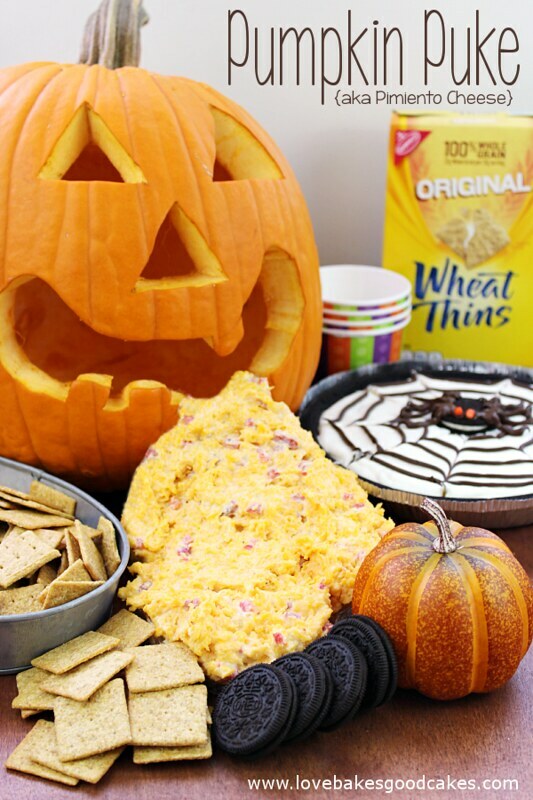 In preparation for a busy night, the ghosts, pirates and princesses in your life will love snacking on Wheat Thins and Oreo before heading out for some Halloween fun! 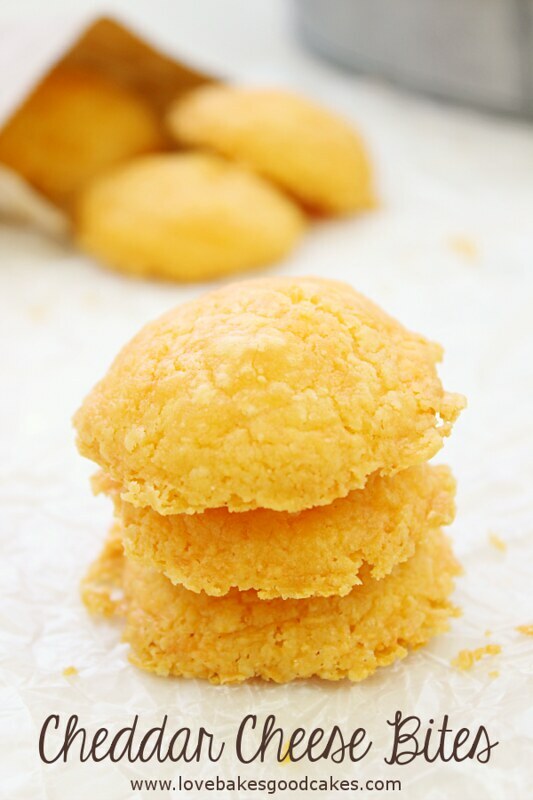 They are the perfect Halloween snack! 2. Store covered in the refrigerator and use within one week. 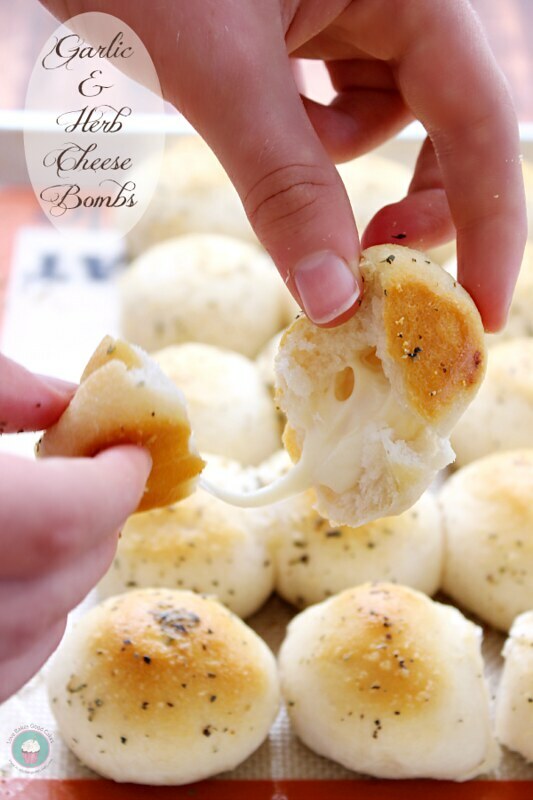 Serving suggestions: Serve with crackers, celery sticks or as a spread on bread. Add a spoonful atop a grilled burger. Pimiento Cheese makes a mean grilled cheese sandwich too! Note: I used saran wrap to form the “puke” for the pumpkin. I made a small ball on one end of the saran wrap and attached it to the inside of the pumpkin with a toothpick. I then formed and filled in the saran wrap with the Pimiento Cheese. Any parts of the saran wrap that were showing, were easy to tuck behind, as not to be seen. No Halloween party would be complete without dessert! 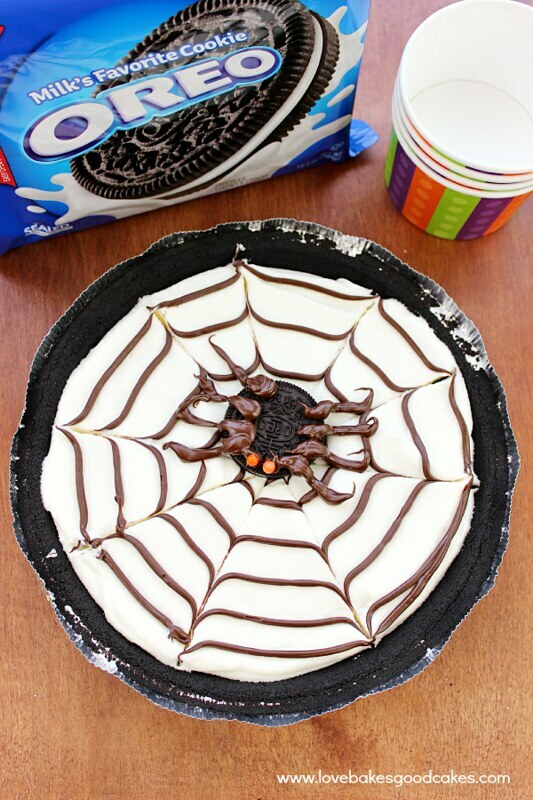 I made a quick and easy pudding pie using a pre-made Oreo crust. I piped some circles on the top of the pie using melted chocolate chips, then quickly drug a knife through from the middle to the outside – making it look like a spider web! An Oreo cookie on top with more melted chocolate chips for the legs and 2 orange sprinkle eyes made an easy dessert everyone loved! 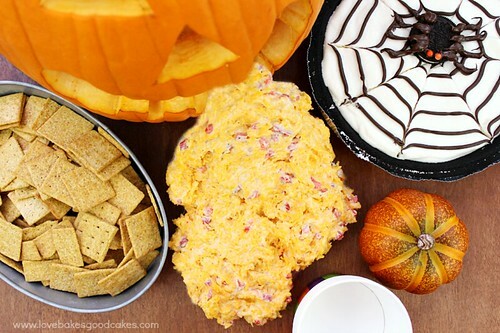 This Pimiento Cheese recipe with Wheat Thins and the Oreo Spider Pie were quick and easy to make … maybe I’ll take these to the Halloween Block Party?! 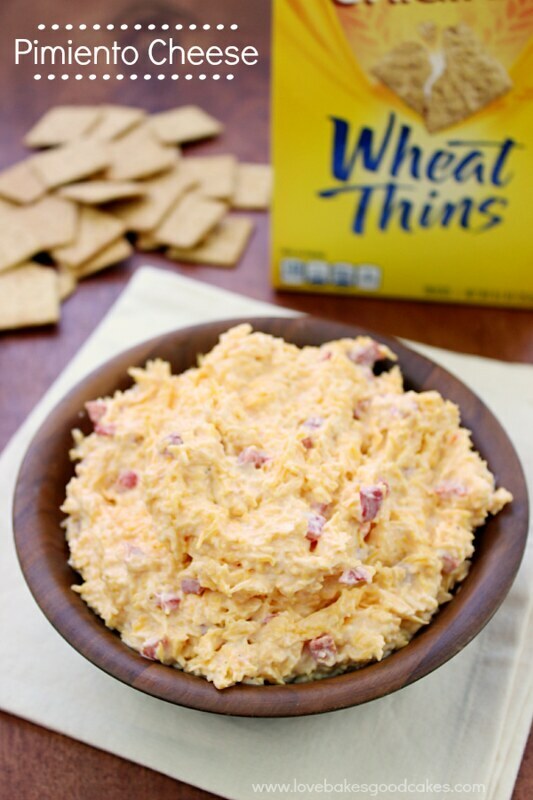 I’m dying to try the Spicy Buffalo Wheat Thins – maybe I can take those with a Buffalo Chicken Dip?! I would love to know what your favorite Halloween snacks are! Do you have a dip that goes perfect with Wheat Thins? Feel free to share your ideas in the comments! Oh Goodness!! LOL!!! You are just so bad my Friend!!! If I didn't already know it, I could tell you have a houseful of boys!!! I know they are loving this! !